This series of craft projects features basic leather craft techniques using suede. Crafting with suede is an easy way to get started with leather crafts. Come back for more leather crafting fun in the weeks ahead! Woven Suede Bracelet - See how to make a bracelet by weaving narrow strips of suede into a suede leather band. It only takes scraps of suede in two contrasting colors to create this soft bracelet. Make one to coordinate with a special outfit or to give as a gift to a friend. Leather Bookmarks - In this project, make a simple leather bookmark in one of five designs. The shapes include an eagle and a rocket. 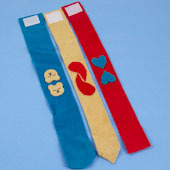 Bookmarks always make great gifts and leather ones last virtually forever. If you are new to leather craft, start with this project! Suede Leather Bracelets - In this project, create a bracelet from scraps of suede leather. Cut a strip of leather, glue on motifs of a contrasting color and fasten with a Velcro® fastener. This is a good first leather craft project and requires no special leather craft tools. Bracelets made of suede are any easy introduction to leather crafting. See the Suede Leather Bracelets craft project.